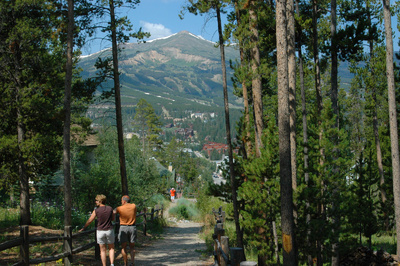 View from the walking trail between Goldflake and downtown Breckenridge. Established in 1859, Breckenridge's historic core was laid out around the Blue River, and ran north for about six long blocks from the train depot near Boreas Pass Road up to the county courthouse. Whatever historic buildings were west of the Blue River no longer remain - several fires did most of destruction, age the rest -- and have been replaced by the slopeside neighborhood made of condos and townhomes built since the creation of the Breckenridge ski resort on the slopes above them. Shock Hill is one of the newest areas on this side of town and is situated on a distinctive hill - Shock Hill - just above downtown. North and east of what is now a national historic district are subdivision built on lands that had previously been scattered with gold mines and associated miners' camps, mills and roads. Wellington Neighborhood is one of New Urbanism built on the reclamation of the old Wellington mining operation on French Creek that included an addition of open space along with the cleanup. Also found along this Creek is the neighborhood usually called French Creek (but officially Valdora Village) and Vista Point and further north: Huron Heights, Quality Hills, Western Sky Ranch -- all accessible by car from French Creek road. As the crow flies north, you'll find Silver Shekel and the Highlands at Breckenridge which span the hills between French gulch and the Swan River valley. Adjacent to the historic center on a hill on the northeast side is the Weisshorn, and just beyond it the smaller new neighborhoods of Corkscrew and Revetts Landing. Directly east of downtown you'll find walking trails climbing straight up to the Goldflake neighborhood, and further uphill to Breckenridge Heights. Below Breckenridge Associates Real Estate has created a search for you that shows all the near in neighborhoods (the French Gulch neighborhoods) on the north side of town, east of Highway and those east of downtown. The Highlands at Breck as well as Silver Shekel will each have their own search. If you need a more complex search created, please feel free to call any of the Breckenridge Associates realtors. Be sure to sign up or log in with Breckenridge Associates to take advantage of our free, world-class search tools. Save property searches based on your own criteria and get New Listings meeting that criteria as soon as they come on the market. Sign up with Breckenridge Associates and you’ll have the MOST FREQUENTLY UPDATED search online, and get independent,local knowledge, too. Get New Listings First - Sign Up! Copyright © 2019 SAR MLS. The information displayed herein was derived from sources believed to be accurate, but has not been verified by SAR MLS. Buyers are cautioned to verify all information to their own satisfaction. This information is exclusively for viewers' personal, non-commercial use. Any republication or reproduction of the information herein without the express permission of the SAR MLS is strictly prohibited. Listing information last updated on April 22nd, 2019 at 3:48am MDT.